Welcome to part two of the SOLID OOP design pattern series. You may wish to subscribe to the blog to stay tuned in as I post new issues in this series. SOLID is not a language, it’s not a framework, it’s a set of principles to help guide your team to design better applications. Using these principles will help ensure your code is adaptive to change. In this series, I’ll be using C# for examples, but the same principles apply to any OOP language: Python, Java, C++, etc.. Using SOLID design principles require a fundamental understanding of classes, interfaces, and class inheritance. The second letter in SOLID stands for OCP: Open/Closed Principle. This principle, defined in Bertrand Meyer’s 1988 book, Object-Oriented Software Construction, might first appear to be an oxymoron like Advanced BASIC, Microsoft Works, or American Soccer, but the definition is simple: “Software entities (classes, modules, functions, etc.) should be open for extension, but closed for modification.” Let’s break it down. 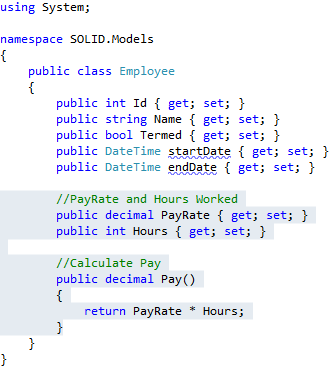 You should write classes so they can be extended through inheritance, allowing for requirements to change while locking in current functionality. One way we can accomplish this is to write interfaces and abstract classes, in Object Oriented Programming this is known as polymorphism. Covering polymorphic strategies exceeds the limits of a single post, but what you should take away is that your base interfaces and classes should be abstract enough to allow inherited classes to override functionality. Confused yet? Let’s look at a simple concrete example. 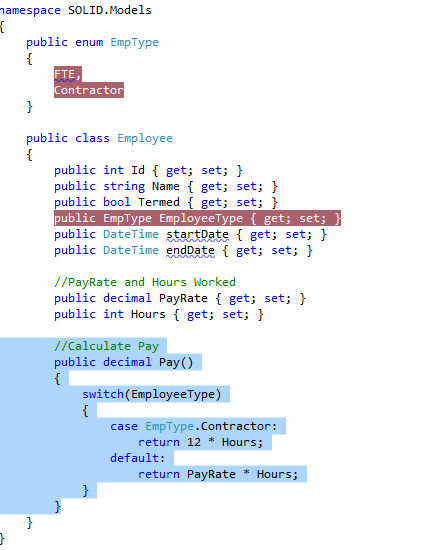 Writing our class this way forces us to change our existing code each and every time Payroll requests a new pay requirement. 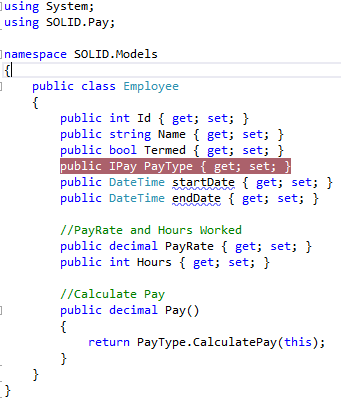 If we know requirements won’t change, SOLID would fall under YAGNI (You Aint Gonna Need It).. but If we anticipate requirements changing then we’ll need to design maintainable code. Next week we’ll continue our SOLID principles building on what we’ve learned today with LSP: Liskov Substitution Principle. See you then!